This vegan / vegetarian one pot meal is a variation of the classic Vanghibath. I have used way less spices and inserted a few features from other dishes that I like. Toast the peanuts and sesame seeds in a dry saute pan until the contents are warm. Do not let the sesame seeds burn. Remove from fire and let cool on the countertop. Rinse eggplant and chop off the stem and bottom. Chop into 1 inch cubes. This will make about 4 cups. To avoid oxidation, keep the cut eggplant in a bowl of water until you are ready to use these. Peel and slice onions into thin slices. Chop tomato the same size as eggplants. By now, the toasted seeds from step 1 would have cooled. Using a mixer, grind these to a coarse powder, in the smallest jar you have. Transfer to a bowl and keep aside. In the same mixer jar, grind ginger, garlic and curry leaves to a coarse paste. Do not add water. In a pressure cooker , add a little oil and saute the fennel seeds and bay leaf. When the spices are toasted, add just a fistful of the sliced onion. Stir until the onions turn translucent. Carefully add enough water (I use 1:1. 5 ratio) to cook the rice. Add rice and let it cook with enough salt. I usually cook basmati rice for 1 whistle. While the rice is cooking, start making the masala by starting a wide heavy bottomed saute pan on medium-high fire. Add oil for sauteing. When the oil has warmed, add black cumin and fry it in the oil. Also add the ginger garlic paste from step 7. Fry it until the raw smell dissipates. Now add the sliced onions and wait for it to turn translucent. Add the chopped tomato and a little salt. When the tomato has cooked through, add the eggplant. Also add turmeric powder, chili powder and coriander powder. Do not add salt at this stage. Eggplants can go from raw to mush very quickly. And there is a place and use for mashed eggplants ,just not in this dish. So, avoid doing anything that would cause this. Cook uncovered, with no salt and no added water and try not to stir a lot. Let the eggplant cook on medium fire for about 10 minutes. The eggplant is done when the pieces are no longer spongy and are still firm. Add just enough salt for the eggplants. Remember that you have already added salt to the rice, in step 10. Also stir in the dry masala from step 6. Let this cook for another 5 minutes, so the salt gets enough time to seep through. When the rice is ready, mix the rice and eggplant masala in a bowl. Add about 1/3rd of the rice to a wide mixing bowl. Drizzle gingelly oil / extra virgin olive oil. Add half the masala. Add another 1/3rd of the rice, in a thin layer . Top with the remaining masala. Sprinkle finely chopped cilantro on top and gently fold to mix the rice. If needed, use the remaining 1/3rd of the rice. Gently mix until there are no white rice specks. 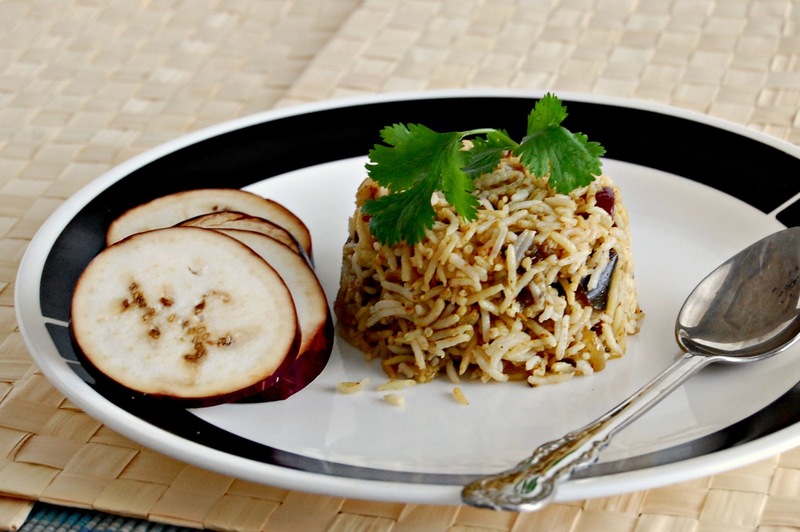 While this might seem like a lot of steps, this is one of the easiest rice recipes. Some of the above steps are pretty intuitive so you won't spend much time doing these steps. Try this for dinner this week and let me know how you liked it. Suggested accompaniments are cucumber raita or tomato kurma. Love to taste this now... Yummy ! Reana, you guessed right on the cryptic clue - good one - and you were first to do it.